Manukaguard Manuka Honey Energy – Honey Dew Plus – 75% Honey Dew Honey and 25% Manuka Honey is designed to provide a simple and all-natural, daily nutritional boost. It provides glycogen stored in muscle tissue until user need it. This formula delivers a nutritious balance of antioxidants and oligosaccharides which help maintain and promote beneficial probiotic activity and prebiotic function. Gives you 7.5 times more energy than one of those high-caffeine energy drinks. No crash. No artificial ingredients. 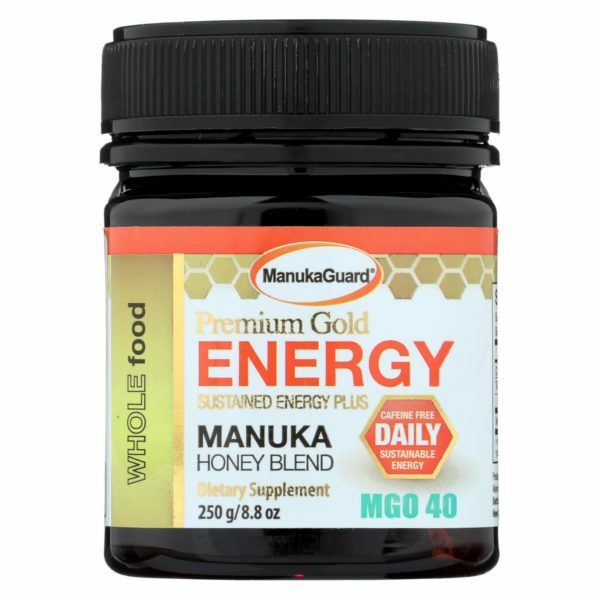 This genuine manuka honey blend from New Zealand provides glycogen stored in muscle tissue until you need it. 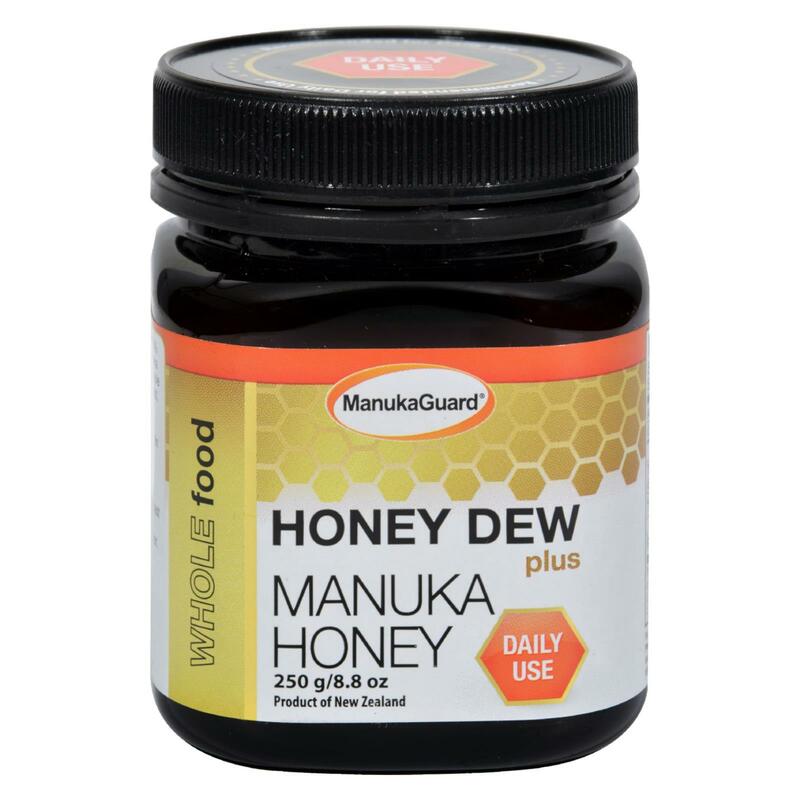 Get all day energy support with Honey Dew Plus – Manuka Honey by ManukaGuard. Honey Dew Plus also helps promote healthy weight management. IF THIS HONEY CRYSTALIZES PLACE JAR IN HOT WATER UNTIL CRYSTALS DISSOLVE. Not suitable for children under the age of 1 year. Keeping the human population healthy with products rooted in science; that very quickly PRODUCE A HEALTH BENEFIT. The ManukaGuard team RESEARCHES nature’s bounty by hand picking each 100% natural ingredient, seeking to maximize efficacy PRIMARILY through the use of Manuka Honey. Gavin Gear founded ManukaGuard after suffering from acid reflux disease for over 30 years, moving from one ANTACID product to a stronger ANTACID product, then again to a stronger ANTACID product until one day there was not a stronger ANTACID product available. HE WAS OUT OF OPTIONS and desperate for a solution and with his education in the sciences he went to work to create a product. With the help of a childhood friend from New Zealand he learned about manuka honey, immediately flew to that country to study the existing research. This led to the formulation of a liquid that worked. He tells the story of the number of times he threw up because the formulation was too potent! Never-the-less he persevered and although Nutralize does have a strong taste, it is quite tolerable and has resolved heartburn and stomach acid for thousands of people without the use of any drug, chemical or ingredient that is not completely natural and certainly tastes better than the chalky liquids he drank for years. After discovering manuka honey, and in particular medical grade manuka honey he saw it was possible to resolve health issues for longer and longer periods of time. Frustrated with the pharmaceutical industry that seemed to him to produce products that relieved symptoms rather than addressing the underlying issue(s). Gavin believes there are health issues that can be resolved. That said, having had a pancreatic tumor, he also has STRONG faith in his local medical community and understands the need for pharmaceutical drugs, after all, THEY SAVED HIS LIFE. SUPPORTING THE INDIGENOUS PEOPLE OF NEW ZEALAND. The New Zealand Maori own and control the bulk of the lands from which ManukaGuard Manuka Honey is harvested so by purchasing this brand the Maori get economic benefit.